The 1886 Spirit™ SD Boombox brings new technology into the classroom with its built-in SD card slot and USB port, allowing the Spirit™ to work with the latest formats and connect with the lastest media players. 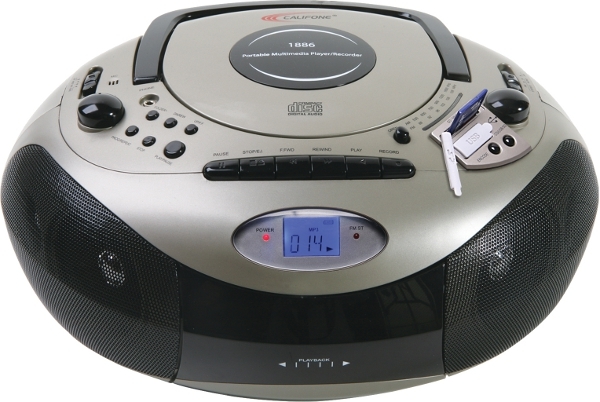 It also has all the features of the classic classroom boombox: CD player, cassette player/recorder, & AM-FM radio. Top-mounted 3.5mm headphone jack is designed for individual use or to connect to a jackbox for group learning activities. Built-in microphone for recording student responses and projects directly to cassette. Made from shaterproof ABS plastic to withstand the rigors of daily classroom use, and features steel grills that prevent accidental damage to the recessed speakers. This is the perfect multimedia player for group or individual reading activities, literacy, ELD, ESL, and other language learning programs.